Last week, Lisa Salama, a fashion embroidery specialist, visited our school to share her industry experience and expertise with our BA (Hons) Fashion students. Fashion embroider Lisa Salama, who has worked with companies such as Alexander McQueen and Jasper Conran, visited our Fashion studio to run an embroidery workshop and share her insider knowledge. Lisa began the session with a presentation, explaining how she first started her career. "I studied Embroidery BA at MMU. After that I did a 6 month internship at Mary Katrantzou and basically never left. I was there for 5 years and grew the embroidery dept, eventually becoming the Head of Embroidery." Lisa then entertained our BA (Hons) Fashion students with tales of dresses made from printed crystals (costing more than £30,000) and explained how these dresses were constructed and why they are so expensive. She then showed some of the amazing samples she has made over years, and shared the tips and insights she has learnt that now sees her working with companies such as McQ at Alexander McQueen, Safiyaa and Jasper Conran! 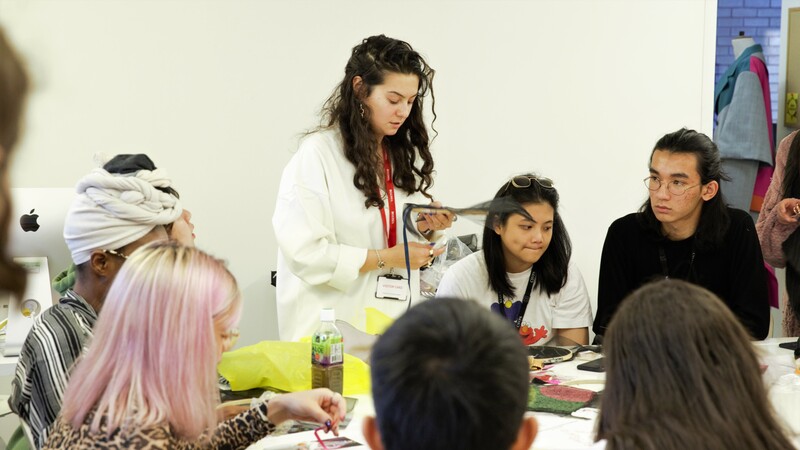 Lisa, who was previously Associate Lecturer at the London College of Fashion, University of the Arts London, as well as Guest Lecturer at the Royal School of Needlework then gave our students advice on how to break into the fashion industry. "I'd advise students to do their research and make sure they're aware of a broad range of relevant designers and brands. I'd also advise applying to a brand that is relatively small, but that is getting a lot of hype and press attention. This can lead to an injection of funds into the brand, and if you're in there at the right time, job roles can grow exponentially. Finally, I'd say see the opportunity and merit in every industry experience and the contacts you can make, and try to grow a professional network." The session then finished with a workshop, where Lisa taught our Fashion students how to embellish using sequins and ribbons and how to create a caterpillar style embroidered section using paillettes (sequins with holes at the top) and a ribbon quilling technique. Inviting Guest Lectures to share their expertise, lead workshops and set live briefs is an integral part of our teaching. To find out more about our courses, click here, to learn more about our BA Fashion course, and click here to learn about our BA Fashion Branding and Creative Communications course. 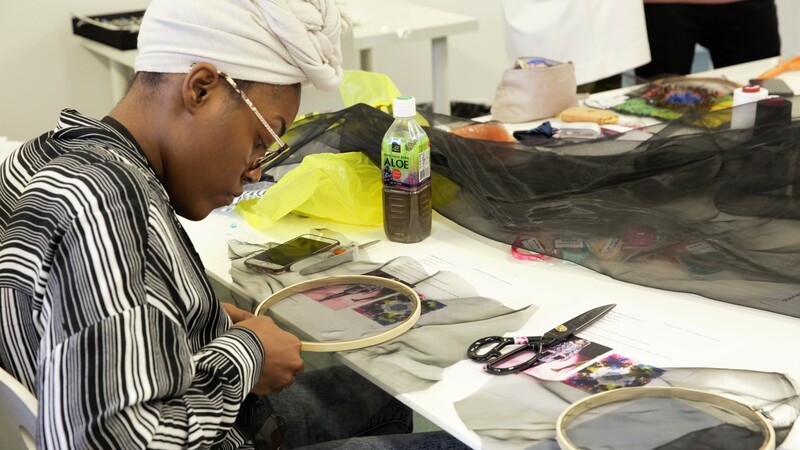 To read about other workshops that have taken place on our course, such as, our exclusive competition with Superdry, which gives one of our students the opportuntiy to visit Superdry’s headquarters in Cheltenham, UK and have their winning design created as a garment! To read the full story, click here.